The racing in Suzuka tends to deliver better than at other tracks, and this year didn't disappoint. Although Red Bull took another dominant win - actually securing themselves a 1-2 on the podium - it wasn't as straightforward as they have experienced lately. Meanwhile, Lotus were the next best team, rather than Mercedes who were having a shocking weekend. Ferrari also clung on to their mathematical championship challenge but weren't on the pace when they needed to be. It could all be over soon but in Japan, there was still life left in the season. Red Bull still managed to claw both pole position and the race victory out of the Japanese Grand Prix, but for a change it wasn’t Sebastian Vettel being supremely dominant and wiping the floor with the rest of the competition. The reliability trouble often seen on Webber’s car was found on Vettel’s instead, with a KERS issue denying him the one lap pace to take up his usual spot at the head of the grid. Webber was the top Red Bull in qualifying, the only time so far this year that he has managed to beat Sebastian on a Saturday. We know that Webber has a history of poor starts when it comes to getting away off the grid, but it was a surprise to see Vettel also get bogged down off the line as the race began. Instructed over and over again to keep his head and let the race come to him, Sebastian eventually wound up in front and took his ninth win of the year, and his fifth in a row. Webber, meanwhile, fought his way past Romain Grosjean to finish second and scoring Red Bull maximum points in Japan. Thus, both championships look more secure for ever for Red Bull. They have a visibly frustrated Mark Webber desperately searching for one more victory before it departs, and a hungry German champion hoping to claim his fourth title in a row. 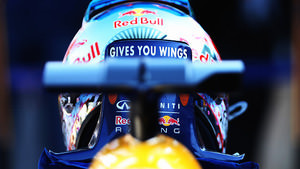 The only fly in the Red Bull ointment was the news that chief aerodynamicist Peter Prodromou is defecting to McLaren. Red Bull have such a complete package, that losing any part of the team is bound to have some effect. The only question is how big it will be. Kimi Räikkönen has been struggling in qualifying, and has pinned the blame on the old-spec Pirelli tyres. The Finn believes the 2012 style rubber is slowing him down in qualifying, but we’ve seen time and again that over a longer distance, Kimi can claw his way back up to a good result. From the bottom of the top ten, Räikkönen finished the race fifth, but he still didn’t seem completely comfortable in the car. He said he was happier than he had been at the last race in Korea, but the balance seemed firmly in Grosjean’s favour this weekend. Romain proved a lot this weekend. His qualifying pace continued to be strong, he made an excellent start off the grid (something which has been his Achilles’ heel in the past), and he held off pressure from Webber for much longer than seemed possible as the race drew to a close. Unfortunately for Grosjean, he did end up losing the place to Webber and finished third – a disappointment only because he had been leading at one point and truly believed he could have won. It’s the perfect time for Grosjean to step up, though. With Räikkönen departing next year for Ferrari, the team need to know they have a number one strong enough to lead them to better things. They worked through the team orders consternation from Korea and came back even stronger in Japan. Even Sebastian Vettel was praising Grosjean’s performance on Sunday. The constructor’s battle could be interesting, as Lotus closed up to within 23 points of third place Mercedes – 23 points that could easily be overhauled over the next few weeks. It's great to see such a good fight in the race and both our cars show so strongly. Once again, both drivers, our strategists and the pit crew performed brilliantly and we did the very best we could on track. We don't have the pace to beat Red Bull, but today we showed them that we are nevertheless quite formidable. It seemed odd during the race how difficult Fernando Alonso found it to get past Felipe Massa. In the past, a swift word from the pit wall would have sorted the situation, particularly with Ferrari’s never-ending belief that they stand a chance in a championship that has long since gone another way. What was more surprising was how casually they reacted, once it emerged that Massa had ignored team orders. The Scuderia are well known for their team order troubles, and this could have been another blot on the horizon. They say it’s all fine, and they continue to support Massa as he hunts for another team to drive for. Is this a new zen attitude for Ferrari, or are they just keen to get this year over with as painlessly as possible? Meanwhile, in terms of on track performance, things seemed a little brighter for Ferrari this weekend but they still lacked any real performance. They were lucky that Mercedes had a very trying Sunday to allow them to claw ten points ahead in the battle for second place in the championship. Alonso dropped behind Massa in qualifying, but fought his way past in the race, and spent a lot of time staring at the back of Nico Hülkenberg’s Sauber again. He did manage to get past the German, finally, and finished the race fourth. Felipe Massa was having a reasonable race until he was handed a drive through penalty for speeding in the pit lane. Then it was a matter of battling for tenth, picking up just the one point. Sauber enjoyed another very successful weekend, with both drivers finishing in the points for the first time this season. Esteban scored his very first points in Formula One, after a good climb up through the field. Qualifying was mixed for the two Sauber drivers, as Hülkenberg managed to get into the top ten but Gutiérrez was knocked out in Q2. After the sessions, the stewards fined Sauber 20,000 Euros for Nico Hülkenberg blocking Max Chilton – the team getting the penalty as they were deemed to have provided incorrect information over the radio. Sauber appealed with new information to the stewards but their pleas were rejected, leaving them to concentrate on the race. Hülkenberg admitted he was surprised by the pace of the car, particularly when he was able to pull away from Fernando Alonso at times. Eventually he fell back behind the Ferrari, and must have been disconcerted to see his teammate so close behind. Esteban managed to keep Rosberg behind him, and the Sauber pair scored a very healthy double points finish to celebrate Peter Sauber’s birthday with. They’re now within fighting distance of Force India in the championship standings, and if their performance continues as it has done so far, that 17 point deficit may be recovered before the end of the year. This weekend, it didn’t quite seem like the Mercedes cars had the pace they’ve been used to. Where we’ve always held out a little bit of hope that the German squad can take the fight to Red Bull, it felt like they were lacking that ability throught the weekend. Lewis Hamilton was best of the rest on Saturday, scooping third on the grid but still two tenths off Vettel who didn’t have the full package during qualifying. Lewis and Sebastian were a lot closer at the start of the race – too close, in fact. Vettel’s front wing knobbled Hamilton’s tyre, causing a puncture and an early stop. Although the Brit tried to continue, the damage from a full lap on three wheels was too much and he was forced to retire. Nico Rosberg ended up the sole Mercedes runner, but things weren’t that easy for him either. Nico started sixth on the grid, and had a good start off the line. An unsafe release in the pit lane cost him time both during that stop, and for the subsequent drive through penalty, so that his race was compromised. They switched to the unpopular three-stop strategy, and took home a couple of points – but not enough to shore up their championship position. Despite what I think, team principal Ross Brawn believes they did have the pace to challenge for a good result, which makes their retirement and drive-through-penalty strategy change even more frustrating. Our lap times were pretty competitive and the tyre durability was good but for various reasons, we weren't able to race well… The team has worked extremely hard over the past two weeks and I still believe we have the potential to finish the season in second place in the Constructors' Championship but we have to use the potential of the car to the full in the four remaining races to achieve that aim. Mercedes released Nico Rosberg from a pitstop into the side of Sergio Pérez, and that was just the start of the incidents between those two. Later, they collided as Rosberg was overtaking the McLaren driver, and Pérez picked up a puncture. For yet another race, Sergio has been branded with dangerous driving conduct, and it’s another race where the team are forced to defend him – ultimately saying that he’s being picked on by the others. The puncture dropped Sergio from his 11th place on the grid to 15th, and it’s a race he wants to put firmly behind him. Meanwhile, teammate Jenson Button started from tenth having just about made it into the top ten shootout on Saturday, and he managed to finish in the points as well. The Brit was hoping for more though, blaming a late set-up change that, you’ll never guess, gave him too much understeer. McLaren also had their strategists working hard as they switch from a two to three-stop race and must be disappointed that a weekend’s hard work ends in just a couple of points. McLaren were bolstered by the news they have hired Peter Prodromou from Red Bull’s aerodynamics team, but that move isn’t going to happen until next year some time, so there’s still an awful lot of work to do until then. Force India have something to celebrate this week, if only because they got both drivers to the end of the race. Paul di Resta, in particular, will have been relieved to see the chequered flag – but no doubt disappointed to finish just outside the points paying positions. Adrian Sutil did his best to compromise the weekend, starting Saturday with a crash that forced some hurried repairs and a costly gearbox change. He qualified 17th, with Di Resta only a few spots further up the grid in 12th. Paul didn’t get a great start off the line, and found himself battling with traffic to a degree that limited the life of the tyres. Sutil did make up some places from his starting position, but admitted he didn’t have the pace to make much more progress. The team as a whole have taken a good look over their shoulder and spotted Sauber rising up towards them quickly. If they lose out on seventh place this year, it will be another season where they don’t live up to their own expectations, but it could also be very expensive in terms of the budget for next year. We simply don't have the pace, we are just hanging around at the back end of the top 10 and the Saubers are looking strong so we can't challenge them. We probably did better than we thought we would do [in Suzuka] so that's a good sign. But both the race and the qualifying pace of the Sauber is such that unfortunately we can't compete with it. Vergne’s weekend got off to a pretty dramatic start, as the Toro Rosso caught fire during the first session of qualifying. Pinpointing the issue to the brakes, the team patched up the car but couldn’t help him from 18th on the grid. If Ricciardo’s qualifying performance is anything to go by, though, there wasn’t an awful lot more to be got out of the car, with the usual issues, balance and tyres, as well as complaints about the wind. On Sunday, things were looking a lot better for Vergne as he moved through the order and finished ahead of his teammate. It wasn’t enough to get into the points, after a slow pit stop put him in traffic that held up his progress, but it was a reasonable finish for the Frenchman. Ricciardo was one place behind in 13th, yet another to receive a drive through penalty during the Grand Prix. This was for gaining an advantage during an overtake by moving off track, and the resulting penalty halted any strategy plans Toro Rosso had made. The star qualifying performances we have seen from Toro Rosso recently appear to have evaporated for now, and that makes it harder for the duo to get good results in the race, but the team had a lot to contend with – from fires to drive throughs – and will be happy to move on from Japan. Williams started their weekend with a hefty fine following an incident with Pastor Maldonado’s left rear wheel. The entire wheel detached itself from the car, and whilst it didn’t fly off in a dangerous manner, the stewards still deemed it to be a “serious safety issue.” Both drivers managed to keep all four wheels on the car during qualifying, and were slightly better than the previous week. The Williams pair started from the midfield and ended up there too, and it wasn’t until the very last lap that they didn’t anything particularly worthy of attention. Pastor Maldonado overtook his teammate in an aggressive fashion that left Bottas both bewildered and off-track. It’s good that the Venezuelan feels fired up enough to fight for 16th place, particularly after recent comments that he’d rather stay at home than drive the midfield F1 teams, but Williams are lucky it didn’t end in a collision. Those inter-team clashes can be very embarrassing. Ultimately our pace wasn't good enough. This circuit is hard on tyres and our tyre life was on the limit so we couldn't pit any earlier than we did otherwise we risked not making it to the end of the race. Caterham really didn’t have a good weekend all round, and their only takeaway can be that they still managed to finish ahead of Marussia. Or at least, one half of the team did. The other half finished at exactly the same place and time as Marussia, as Giedo van der Garde and Jules Bianchi clashed on lap one, they both spun off and that was their Sunday over with. Pic managed to have a ten place grid drop after picking up three reprimands, and then a further sanction was placed on him after qualifying. As the grid drop was already in effect, he gained a pre-race drive through penalty, to be completed during the first five laps. Even with the setback, he still finished about twenty seconds ahead of Chilton. A lot of work from the entire team, and not an awful lot to show for it at the end. Max Chilton was full of joy after qualifying on Saturday, as he managed to get ahead of both the Caterham cars. He also finished ahead of his teammate, but Jules Bianchi barely ran – knowing that he would be taking a ten place grid penalty anyway. The way his and other penalties worked out meant that Bianchi actually qualified last but started the race 21st, so he was a place up before he even started.